The Colorado Division of Fire Prevention and Control (DFPC) Professional Qualifications and Training Section is an educational institution that has grown from a one-man, voluntary certification program to a five-person staff that oversees the training and qualification for several thousand firefighters each year. The “Voluntary Certification Program for Fire Fighters” began on June 21, 1979, when House Bill 1243 was signed into law. In the early years, the Division of Fire Safety was a one-man operation. Dean Smith was hired as the original Director and implemented the very first firefighter certification-testing program. Director Smith would take the exams home and he and his wife Joyce would sit at their kitchen table and hand grade exams. “Over the years, additional staff was brought on and working committees for each level of certification were established,” said DFPC Section Chief Mark Quick. “The second hire for the Division of Fire Safety was Support Services Section Chief Theresa Staples who is still with the Division today.” For years, Chief Staples worked with additional staff to develop the certification programs we currently offer. Today, the Professional Qualifications and Training (PQT) Section is composed of five full-time staff members with support from additional members at DFPC. The PQT Section provides educational offerings through statewide extension efforts for Firefighter, Hazardous Materials Responder, Driver Operator, Fire Officer, Youth Firesetter Prevention, Fire and Life Safety Educator and Fire Instructor programs, offering certification levels for each discipline. The Section also hosts three fire schools annually and supports other fire educational and training programs necessary to support the needs of the fire service. “The goal of DFPC’s PQT section is to increase the knowledge and self-confidence in the individual to perform under stressful and hostile conditions,“ said Chief Quick. In 2014, DFPC was awarded an Assistance to Firefighters Grant for the purchase of a Mobile Live Fire Training Unit to help fire departments with limited to no access to burn facilities gain experience with live fire training. 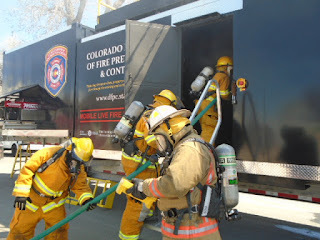 The state-of-the-art, mobile structure provides a safe training environment simulating a realistic structure fire. The simulator provides training scenarios for firefighters to train on fire attack, size-up, incident command, hoseline and nozzle control, and accountability. Since the Mobile Live Fire Training Unit went live in April 2016, 691 firefighters from 47 departments have participated in live fire training with the unit. Of the 691 firefighters, 342 are career firefighters and 349 are volunteer firefighters. With the assistance of volunteer instructors, we have been able to provide critical live fire training to departments that do not regularly have the opportunity to train with live fire. For these departments, the training unit has allowed them to practice defensive, offensive and transitional fire attack, observe hydraulic ventilation, improve hose management skills, and get hands-on with vertical ventilation. DFPC anticipates launching a second Mobile Live Fire Training Unit in May 2017.